AMD has offered up some technical information on the three discrete chipsets debuting in the new MacBook Pro line, showing nearly double the performance on the Radeon Pro 460 over the Radeon Pro 450. The discrete GPU in the MacBook Pro are based on AMD's 14nm FinFET process, and are designed for power efficiency, more than peak performance. All three units provide 80 GB per second memory bandwidth, and are based on the company's Polaris architecture. The Radeon Pro 450 offers peak performance up to 1 teraflop, with 10 compute units and 640 stream processors. The Pro 455 performs up to 1.3 teraflops, and has 12 compute units and 768 stream processors. At the high end, the Radeon Pro 460 available as an upgrade for the new computer provides 1.86 teraflops, and has 16 compute units and 1024 stream processors. 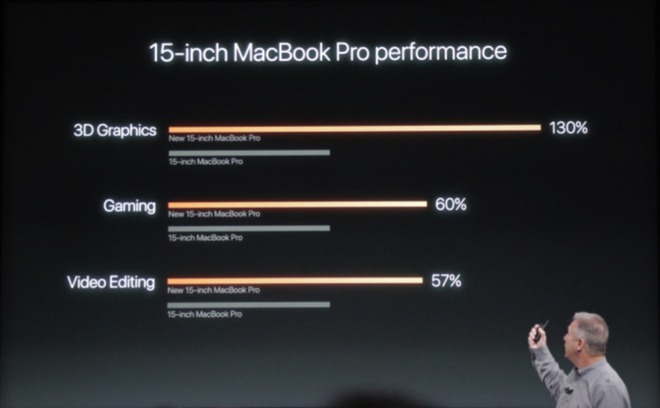 In comparison, the Iris Graphics 540 found on the 13-inch late 2016 MacBook Pro has a peak performance of 806 gigaflops, with the 550 in the higher end configuration coming in at 845 gigaflops. The 2013 Mac Pro desktop GPU D300 FirePro is capable of 2 teraflops per GPU, and the computer holds two. The D500 FirePro can provide 2.2 teraflops per GPU.